In my ridiculous (and exasperating) fashion, I have two talks coming up, of course during the busiest time of the semester. Fortunately, I don’t need to be in class to be in class (the audio from Thursday’s class meeting–yes, they’re having class without me– will be posted to the blog, and I’ll be interacting with students on their blogs, and who knows, perhaps on mine). How exciting, Barbara. Will you Twitter the run-up and the follow-up? To ppt or not to ppt… i find it depends on a few factors. One is time. If I have an hour or more, I’ll use a stack o’ slides for one thing (framing, concepts), then head to wiki for the rest. Another factor is connectivity. Not a guaranteed thing! Great to see it all come together after seeing little bits on your screen as I popped by your office! Jerry Slezak had mentioned Vovux to me, and what little time I spent in it totally inspired me, you have one lucky audience. And only partially because of the presentation medium –what struck me so deeply about your presentation at Faculty Academy last year (and why that talks sticks in the back of my mind like a flashing red reminder of all that is imperative) was the pure intensity of your delivery and the fervent passion with which you challenged the audience to challenge their assumptions about the future of teaching. 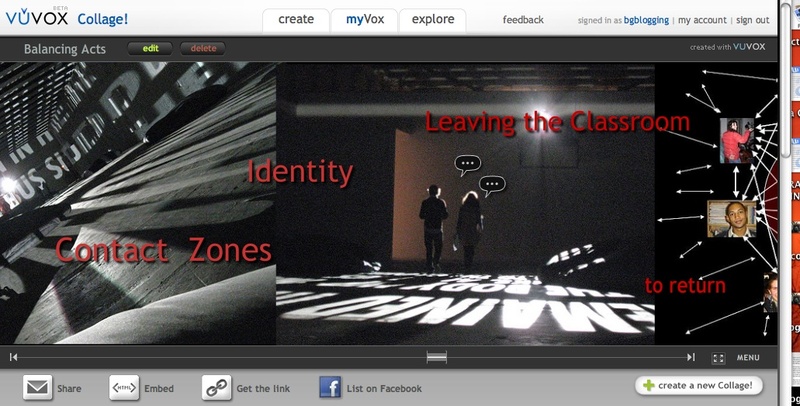 That said, leaving a poetic trace of a presentation with a tool like Vuvox suggests something very tactile about the web that makes its complex relationship to displaced time and actual events that much more compelling. The thought that a presentation can also be an online performance piece that can be stumbled upon or sought after for a wide variety of reasons is intriguing. In fact, it is how we should be presenting, with an eye toward the very media we are examining. This for me was what was so amazing about Brian’s Confessions of a Mashup-Unartist piece, and it was a call to arms for me that If I am going to present on a particular digital medium, I should really be embedded in it. All a part of exemplifying the process and taking the necessary risks to fail and learn, as so many others will and should. I find it hard to be a critic in my role as an instructional technologist if I can’t truly engage the very creative process I am championing with students and professors. Presentations as digital performances makes so much sense to me, and transforms the idea of a presentation from a task to a joyful obsession. Good luck, I’ll be following all the traces I can find. 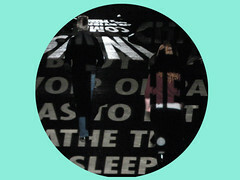 Barbara- this is sheer brilliant visual poetry. Or, in other words, “cool” — I caught the flyby of collage when Jerry tweeted it and marked for return, but now I have a sterling example. Collage seems very rich and I am anxious to see what your thoughts are or better, what the audience does with it. Certainly not powerpoint comas. I’d been mulling recently about trying to do a presentation via PicLens, but collage is rather nicely fluid. I’d have to agree very much with the Reverend Jim- after reading your words and watching your photos for years, seeing you present at Faculty Academy was mesmerizing– I think you could read me a soup can label and make it come alive. Its more than the rich media, it is the message, the energy, and really a whole lotta passion for what you are saying. Strange how that is a rare commodity. When we were children, occasionally in class we’d hear “Eyes on teacher.” PowerPoint has the “B” key and the “W” key for slideshow mode to achieve that effect via creating a black screen or a white screen. I’ve not seen too many people use that in practice, but it is a possibility. I suppose many places can mute the projector for the same effect, but I’ve not seen that done. There is also the issue of whether the presenter actually welcomes questions during or expects them only after. Having a co-presenter, with one of the two roaming with a handheld mic, clearly signals the former. Otherwise, the audience is left to their own devices. Once you get them talking there is the further issue whether the ones in front turn around to hear the questions from those in the back. If they don’t, those question seem like an intrusion in the session. I always preferred the back row, partially for that reason. I concur with redbaiters that your commitment and intensity come through in the presentations and for me that is more important than the visual show on the screen. But I guess you have to go through the thinking of what you would want to see if you were in the audience and satisfy that. How else can you determine what to present, especially to a group with whom you are not already familiar. One last comment on the need for invention. I agree with that, for sure. But having tried something, it’s not always the case that it is perfected the first time out. There is some joy in doing it better. It’s not the same as something fundamentally new, but it is important. So I hope you don’t redo the entire talk each time and that some of which you recycle gets better with experience. Bryan & MEB, Alan, JIm & Lanny–thanks for the great responses. Presenting with the collage this past week was exciting indeed. It was quite something to see the collage on the big screen, to click on the little speech bubble and have the links, the videos, the audio all work very well indeed. I was a little clumsy with the slider to move the collage, but that will improve with time as I learn to work with it. This kind of tool makes such sense to me–mash-ups of this sort are visual poetry, Alan and Jim-you are so right–and why shouldn’t we see presentations as performance art? Lanny, I think the visuals, if we use them, should engage the audience as much as our personal intensity–they are a part of that intensity. I want to stir my audience, to provoke them, to move them to action. I don’t always succeed, mind you, (especially when I present after dinner–10 p.m. my time– after everyone has had a long long day of travel, including me) but if we’re not trying to change the world, then why are we giving talks at all? And as for practice and growing the ideas, I agree absolutely, Lanny. I am always essentially going at the same ideas in my talks, just trying to discover more about them each time. Boy am I slow…I did not even know you had moved until a few minutes ago. Jeez where has MY head been? Great banner across the top of the blog btw.